A storm was approaching. I could see lightning strike the earth far in distance and hear the faint roar of thunder. 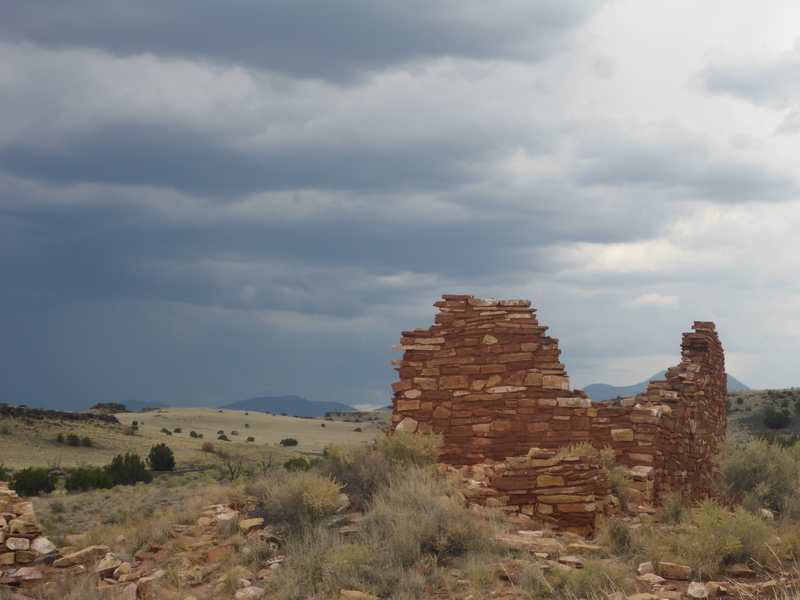 It was time to leave the ruins of the Lomaki Pueblo in Wupatki National Monument. The people who built this and so many of the other ancient ruins I had visited over the past couple of days, had also left this place. Archaeologists still don’t know all the reasons why the tribes left, though theories abound. In this area, the eruption of nearby Sunset Crater played a role, as did climate change. Standing here now, it’s hard to imagine eking out a living in this dry and desolate landscape. As the storm moved closer and I retreated to the relative safety of my vehicle and departed, I couldn’t help think about the storm clouds on the horizon in our own time. There is always doom and gloom. Prophets have for ages predicted the end of civilization and yet here we still are. There is a hubris among many today who believe science will save us. And science has provided many answers, but there always seems to be some unintended consequence. There was a science fiction series called Andromeda and each episode began with some pithy saying. My favorite of these was “Those who fail to learn history are doomed to repeat it; those who fail to learn history correctly – why they are simply doomed.” Perhaps it is wanting to learn history correctly, to understand why the ancients left once thriving civilizations which drive my desire to visit these ruins. I want to believe our society can learn from the past and ensure its future. Though to be honest, I am filled with doubt. A couple of days earlier I was in the ever sprawling Phoenix metropolitan area visiting family and friends. Phoenix, like my home in the Los Angeles area has grown far larger than the local area can support and must import vast amounts of water to slake its thirst. Edward Abbey once said of Phoenix; “Phoenix, Arizona: an oasis of ugliness in the midst of a beautiful wasteland.” What will happen I wonder when the well dries up? There are challenges ahead, and I’m not blind to my own role. This trip will cover several thousand miles and fossil fuels propel my vehicle. My footprints, along with those of other visitors, impact a fragile landscape. Sunset Crater is now closed to climbing due to the impacts of erosion. There is a paradox between visitation and being an advocate for the land, and protecting the land. At the start of this trip I attended a rally sponsored by the Mojave Desert Land Trust to protect the desert monuments. The people there love the desert and all have spent time in it. Becoming intimate with something drives a desire to protect it. Something needed at a time when others would plunder it for short term profit. Which is as political as I will get in this blog. I don’t pretend to have all the answers, or any for that matter. What I do know is the more time I spend in nature, the more adventures I have, the greater my desire to protect these places for myself and for future generations. After leaving the Flagstaff area I headed east. 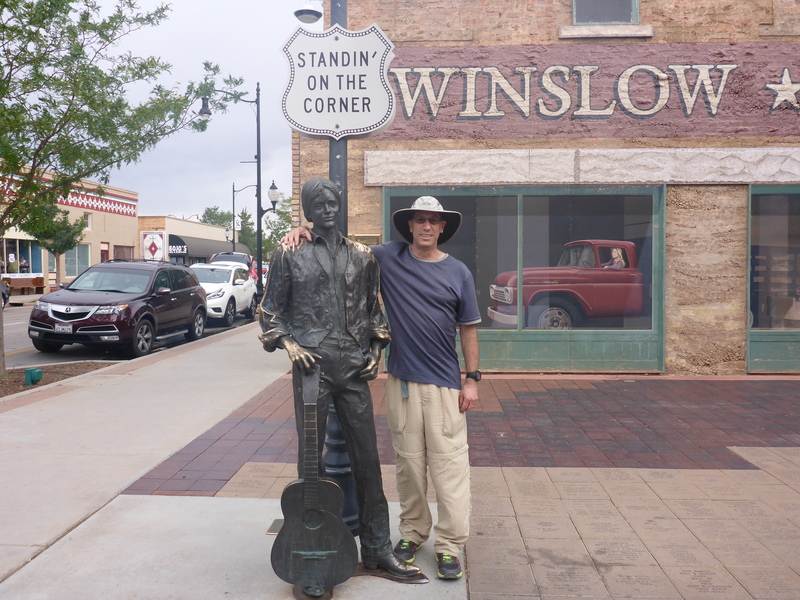 Not above being a tourist, I stopped in Winslow, Arizona and I was definitely not a fine sight to see. The previous night had been spent in luxury SUV accommodations and a shower and clean cloths were yet in the future, as well as visits to more ruins. My morning view. 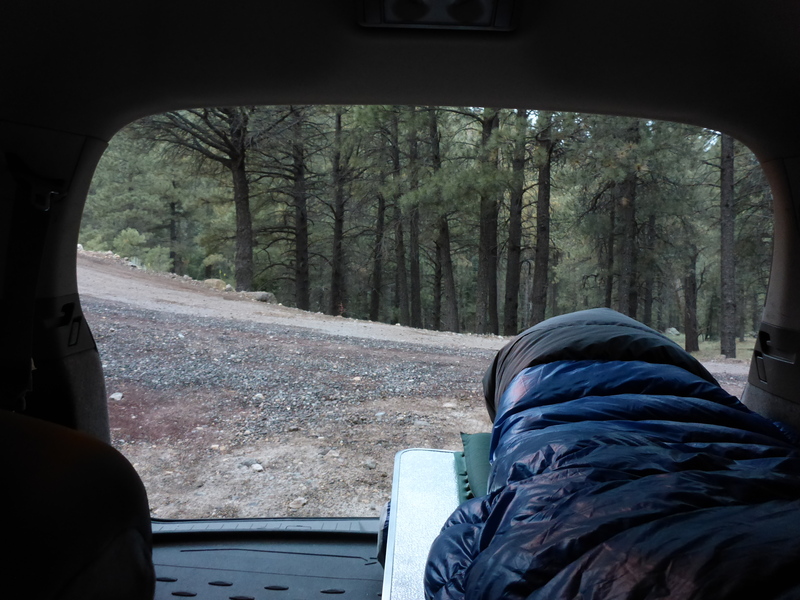 I was camped in the forest above Flagstaff, AZ.